What does one do when the weather turns cold and racing winds down for the season? Besides reading some good books shown here, I decided to return to my roots in Upstate New York where I recently visited the quaint village of Watkins Glen while attending the fourth annual Michael R. Argetsinger Symposium on International Motor Racing History. This symposium was presented by the International Motor Racing Research Center (Located in Watkins Glen) and the Society of Automotive Historians. As a race fan this is a pilgrimage you might want to consider next year as it is fascinating to learn about the heritage of motor racing. You begin to realize how important motor racing was around the world in several nation's advancement of technology, industrialization and even nationalism, let alone the creation of racing heroes. I arrived early on a Friday morning, stopping by the Watkins Glen Chamber of Commerce to meet the staff and to look for opportunities to market my new book, "Echoes From The Glen", Reflections of Race Fans After Forty Years. I met Chamber president and CEO, Rebekah Carroll and staff and was invited to take pictures of their office which shows you how much this community revolves around road racing. In fact the whole town could be a Disney theme park about motor racing. The character and atmosphere of the place is really special for anyone that loves car racing and it is well worth the time to walk down Franklin Street, which is their main street, and visit the shops along the way. One such shop, which is more than a retail store is Franklin Street Gallery; a community arts center. There are many unique pieces of automotive art, books and other memorabilia. 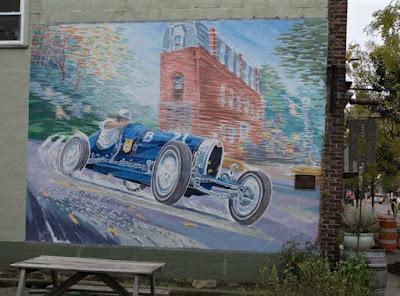 Another nice place to visit is a storefront for Watkins Glen Promotions, a non profit corporation dedicated to planning and organizing quality events in Schuyler County, including the Watkins Glen Grand Prix Festival held in September. (I just ordered some race posters off their website, www.watkinsglen.com/promotions). They have many nice gifts available on the shelf there, or you can order like I did from their website. My time was short, so it was now on to the Symposium held up on the hill as the locals call it, meaning at the race track not far from the village, but definitely on a big hill for us Floridians! The views alone are worth the drive up there. The Symposium is open to the public at no charge (super good deal) and I got to see the huge media center, complete with a large conference room above victory lane where the media gather for all the races. I didn't know what to expect, this being my first visit but I was impressed by the quality of the speakers and the uniqueness of the audience. I sat next to a fine young chap, Timothy Robeers, who was a sports media communications lecturer and doctoral candidate from Universiteit Antwerpen, Belgium. His topic was "From Formula 1 to Formula E and Beyond" and the other fellow at my table was Dr. Mark D. Howell, Professor of Communications at Northwestern Michigan College. His topic was 'Not My Daddy's NASCAR". He is also a senior writer for Frontstretch.com. This whole experience was incredibly interesting and a great way to add a new level of appreciation for the sport of motor racing. If you can't make to the Symposium, you should at least visit the International Motor Racing Research Center in the village of Watkins Glen. I'll finish this post with a few pictures I took while there, including the unexpected early November snow storm that gives a unique view above victory lane at the track.